"Vanderbilt, Amy." Online Photograph. Encyclopædia Britannica Online. Amy Vanderbilt, journalist, cookbook author, society personality, and doyenne of etiquette was born July 22, 1908 in Staten Island. She was the first cousin of Cornelius Vanderbilt. 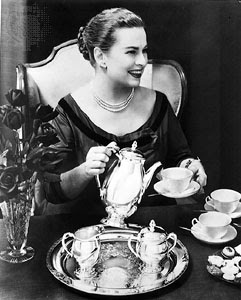 After a number of jobs in public relations and magazine work, Vanderbilt was hired in 1940 by Royal Crest Sterling silverware as their etiquette consultant. In 1948 Doubleday hired her to write a book on etiquette. The result was Vanderbilt's 700-page Complete Book of Etiquette which was released in 1952 after five years of research. Vanderbilt's etiquette rules, which emphasised simple kindness, were considered less rigid than Emily Post's earlier works and her book quickly became a standard in the genre. Vanderbilt also published a cookbook titled Amy Vanderbilt's Complete Cookbook in 1961. Andy Warhol (credited as Andrew) did illustrations for both books. She died in 1974 after falling from the second floor window of her brownstone in New York . The Library has a wonderful collection of Vanderbilt's books all available in the general stacks. A 1995 re-release of The Complete Book of Etiquette is also available on the open shelves of the Rose Main Reading Room. Her obituary is available in ProQuest's historical newspapers. According to her New York Times obituary, although Vanderbilt had little patience for very fomalized behavior, there were instances in which she found traditional roles necessary. For example, she apparently refused to use the title Ms. She is quoted as saying, "Ms. is unbearable. Look it up in the dictionary. It means 'manuscript.'" Melt butter in saucepan over low heat. Stir in flour smoothly. Add seasonings and mix until well blended. Stir in milk and cauliflower liquid slowly. Cook, stirring constantly, until smooth and thickened. Pour over hot cauliflower in serving dish. Sprinkle with buttered crumbs. Sprinkle with a few grains of nutmeg. Makes 1 cup cream sauce. If mixed with crumbs, makes 1 1/4 cups sauce.